Nothing screams summer like a big bowl of guacamole, tortilla chips for dipping and an ice cold margarita. My hubby’s guacamole has a twist and the best part is you can tweak it. In under 10 minutes you can whip up a fresh batch of creamy goodness and impress your friends and family. 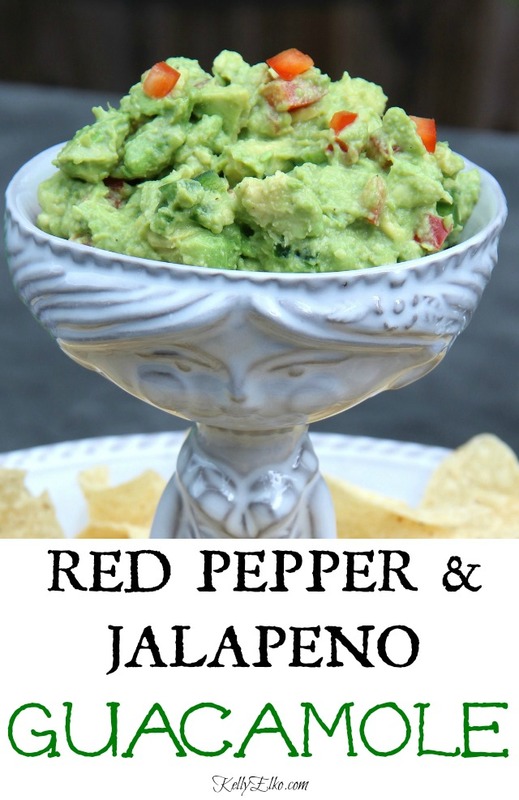 In my red pepper jalapeno guacamole recipe, red pepper replaces the usual tomatoe and adds a little crunch while cumin gives the guac a nice smoky flavor. I don’t like the overpowering flavor of raw onions so I don’t add them but if you love them, by all means add them in! Note: make sure to wash hands after handling jalapeno seeds! 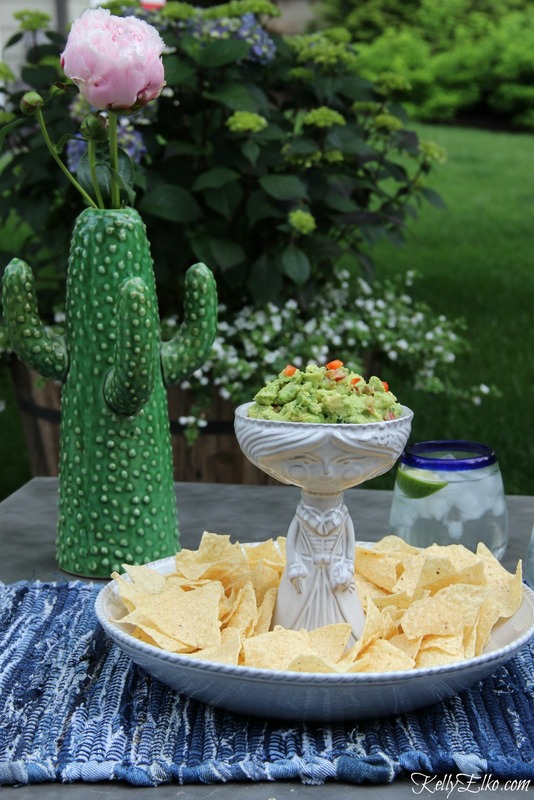 I love unique serving pieces and this one takes the cake (or should I say the chips)! 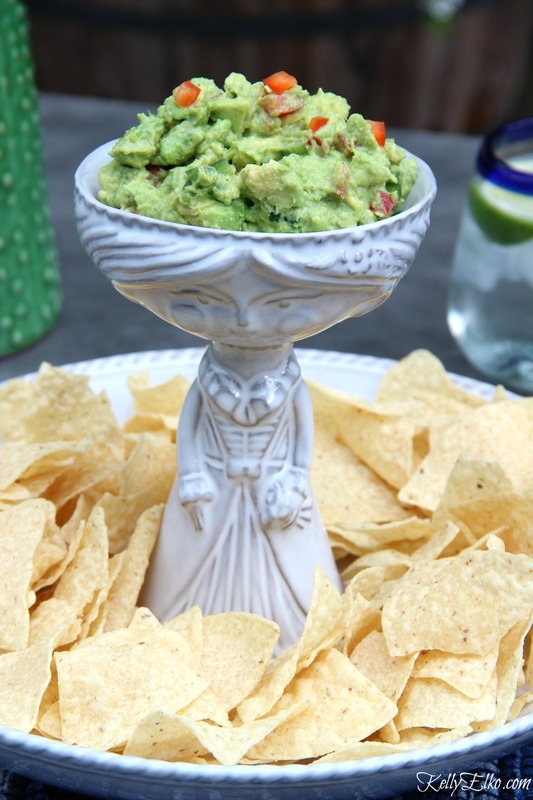 How fun is my Senorita Chip and Dip Bowl from Amara – it’s a definite conversation starter. I recently discovered Amara and was thrilled to partner with them because they have an eclectic mix of unique things for the home like this adorable Cactus Vase filled with my first peony of the season. If you’ve always wanted peonies in your garden, read my Tips on Planting Peonies so They Bloom. Not sure if your avocados are ripe? Check the stem – if it comes off easily and is green underneath, the avocado is ripe and ready to eat. If it’s brown, the avocado is overripe and will have brown spots inside. If the stem doesn’t come off easily, it’s not ready to eat. This would be amazing paired with my Sumer Sangria – get the recipe here! Here’s to long summer days outside on the patio and lots and lots of chips and dip. and another of my favorite clothing stores where everything is 40% off – I’m definitely ordering this top. Hope everyone has a wonderful Memorial Day weekend.